Two recent developments underscore Miami’s emergence as a force to be reckoned with in the cash-flush world of modern arts philanthropy. First, the region’s preeminent funder, the John S. and James L. Knight Foundation, announced a $37 million investment in Miami’s growing arts ecosystem. And second, Miami’s most prominent arts patron, billionaire real estate developer Jorge M. Pérez, announced the creation of two major annual art awards. Knight ramped up its arts giving in the city in 2005—three years after the launch of Art Basel Miami Beach—while a year later, Pérez joined the board of the Miami Art Museum, now known as the Pérez Art Museum Miami (PAMM). Knight has invested $165 million in the arts and cultural life in Miami during this time, while Pérez, as we’ll soon see, played a huge role in positioning the city as a destination for contemporary art. PAMM is also a big recipient of Knight funding. Mid-tier cities aiming to ramp up their cultural profile in short order will find inspiration in Miami’s emergence as an arts hot spot. And regional foundations that aspire to catalyze such efforts can learn a lot by taking a closer look at the Knight Foundation’s collaborative leadership here. Knight’s recent decision to expand local arts funding was complemented by the release of a report— commissioned by the foundation and prepared by research firm TDC—which concluded that Knight’s investments have had a “transformative” effect on Miami, boosting local artistic activity and participation significantly, helping recast the city’s reputation and shift the way residents see their hometown. The report found that local arts attendance rose 27 percent in the 10 years since Knight starting making grants in the city, outpacing population growth. Local employment in arts industries rose 21 percent from 2011-15, reaching 203,649 jobs in 2016. And there was a 265 percent increase in foundation giving from 2004–15, driven by Knight. The report came roughly a year after Bloomberg Philanthropies, upon announcing its 2018 Public Art Challenge, claimed that its initiative has thus far generated $13 million for local economies, employed 820 individuals, and created 490 programs and activities like tours, workshops, and lectures. Both reports are the latest entries in an ever-growing body of research pointing to the measurable benefits of arts-related investments in U.S. cities. Knight’s $37 million in new funding complements and expands the two-tier funding strategy that Knight has used to support the growth of the arts in South Florida for more than a decade. Roughly two-thirds of Knight’s investments have gone to anchor arts institutions, often to help them engage the public, and the rest has gone to bring 384 arts ideas to life through the Knight Arts Challenge. The TDC report also identified some areas for improvement. For example, while the city’s arts organizations remain indebted to Knight’s work, the foundation’s dominance has created a top-heavy funding ecosystem where “arts activities” rely on a small number of funders. In addition, the percentage of arts organizations with less than 2.5 months of unrestricted net assets increased from 42 percent in 2005 to 50 percent in 2015. For an example of Miami’s tight-knit arts community in action, consider the fact that Knight Foundation officials announced the news of its new funding at a ceremony at the Pérez Art Museum, which netted $3 million in Knight funding. 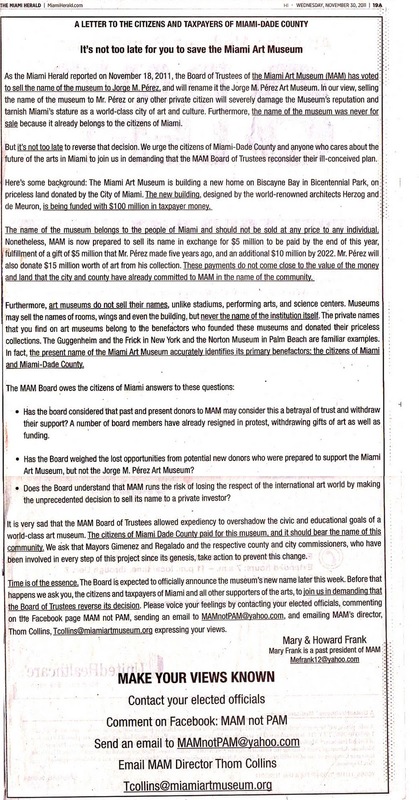 The Pérez Art Museum is named after the Argentine-born “Miami Condo King” and Giving Pledge signee Jorge M. Pérez. He is the chairman and CEO of the Related Group and, a recently as October 2017, was ranked 264th on the Forbes 400 list with a net worth of $3 billion as of October 2017. Pérez has since disappeared from the Forbes list, leading us to suspect that he’s been quietly moving his assets into a philanthropic vehicle to make good on his Giving Pledge. In December 2011, Pérez donated $35 million to the museum to support the construction of the institution’s building. The gift included $15 million in support to the institution’s Capital Campaign, on top of his original $5 million pledge at the campaign’s outset. As a result, the museum was renamed PAMM. Frank, however, was in the minority. Of the 35 board members present, only four voted against the renaming (with one abstention). Nonetheless, Pérez pushed back. In an interview with the Herald, he cited examples of other non-Hispanic donors receiving name rights to public institutions in exchange for similar gifts. The Miami Science Museum, for example, was renamed to the Patricia and Phillip Frost Museum of Science after the Frosts pledged $35 million. “Perhaps stupidly, I thought people would say, ‘This is amazing,’” Pérez said. The controversy eventually dissipated and in July of 2016, Pérez announced he would be stepping away from real estate and turn his attention towards collecting and philanthropy. In November of 2016, Pérez gave $10 million in cash and a collection of more than 200 works by Cuban artists valued at some $5 million to the PAMM. The gift stipulated that $5 million went to the museum’s endowment, $1 million toward Cuban art, and $4 million to Latin-American art generally. Pérez made his broader intentions clear at the time. Miami, which is sort of the capital of the Americas, should have a great Latin American art collection. “It was important to me for a Hispanic person to assume a lead role in philanthropy and have their name associated with a great museum like the Tate or the Guggenheim,” he said. Pérez’s efforts instantly positioned the PAMM as one of the world’s foremost holders of Latin-American and Cuban art. But more needed to done to put working artists on the international arts map. All of which brings us to the two new Pérez-funded art prizes. The first, the Jorge M. Pérez Award, provides $25,000 to a visual arts alumnus of Miami’s National YoungArts Foundation. Dedicated to Latinx artists, the inaugural award recognized Miami natives Chat Travieso, a Brooklyn­-based multidisciplinary artist working with architecture and public space, and Kathia St. Hilaire, a painter and printmaker whose work investigates her Caribbean and black cultural heritage. The inaugural winner of the second prize, the $50,000 Jorge and Darlene Pérez Prize, will be announced in March at the PAMM Art of the Party gala.